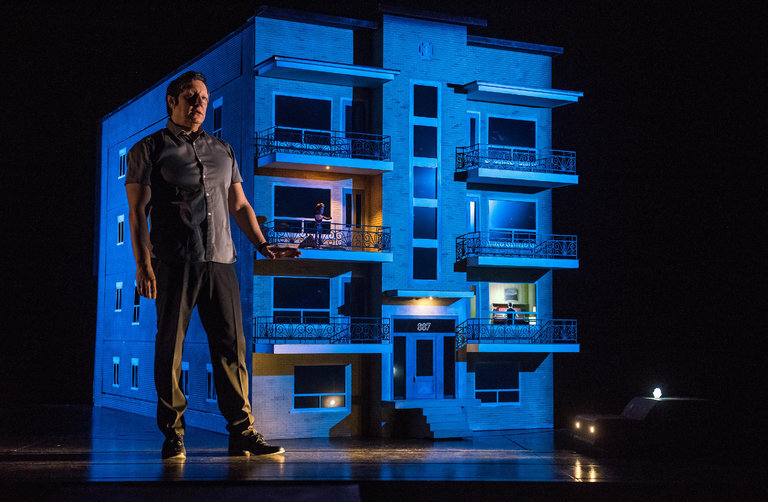 Robert Lepage has always had an unabashed penchant for technology on the theater stage. We have had decades of "physical theater' where props and sets had to be restricted to a column or a stick was the trend, as well as focus on the actor and the lines and the delivery of the lines. He's reintroduced the power of the trickster which is so enjoyable for the child in all of us. The world really lacks in magic, it tends to follow with stubborn sternness the laws of physics and basic ontology. A few people see UFOs and holy apparitions, but these are the lucky few. In 887 Robert Lepage gives free rein to this passion for make believe to recreate the world of his childhood in parallel to his current one. It's pretty spectacular. It would be hard work to describe every trick that is used: cameras on stage, moving trash cans, a building where every window is animated with little characters, etcetera etcetera etcetera etcetera, quite the delight. He plays a lot with size as a whole building is smaller than he when he looks into his past, then he's in his kitchen that's to his size, and in a childhood living room where he is smaller than the TV and the lamp. 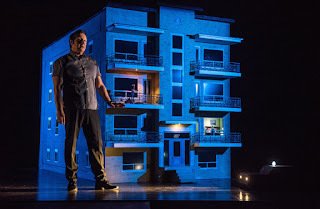 The reality on stage shifts, and his identity shifts too as he alternately plays himself and his father. The stuff with his father is very touching. Working class, his dad had to leave school at 8 - couldn't write or count much, and worked hard to support his family. Themes expand to celebrity and anonymity, Quebec politics, class segregation. And memory of course. It reminded me how much radio was still a large part of life in the sixties and in the seventies. I would lie in bed at my grandmother's and hear the neighbors' radio through the wall, and now I can't remember their name that I thought it would never ever forget. I wish I could recreate that lost world of my grandmother's, the way Lepage did for 887, the street number of the building where he lived as a child. Robert is also just someone you want to look at, whether it's his longshore worker's body, which looks like his father's, his juvenile face, his peeping eyes. He's got perfect control of his hands. He's funny. He switches seamlessly from English to French. But still, I find it hard to watch a one person show that is longer than an hour or 90 min. After that, I think, oh could we please please have another actor enter stage? Reminds me of a Caryl Churchill play that was at BAM, a story about a woman and her son (Heart's Desire) About half way through the play, the kitchen that we had well got used to, suddenly all its cabinets opened and tons of kids run out of the cabinets! (this last sentence is not grammatical, because this is a BLOG) - Imagine going to a one-person show, and a second and third person and a fourth, twenty more, show up unexpectedly, that would be so good. During the show I started having restless legs. I usually only have it right before I go to bed and I have been sedentary during the day. But there I was coming out of the gym and sitting at the show and I was really annoyed and kept on rubbing my feet on the ground probably driving the woman in front of me crazy. There didn't used to be something called restless leg syndrome. I remember my sisters would complain about their legs when they went to bed at night, but there was no word for it. Now there's a word and now there are medications too, naturally. Maybe my legs were reacting to the show because, though the themes were compelling, though he's a great performer, there was a bit too much Machina too little Deus. I wasn't sure whether the play wasn't being fair to my legs or my legs weren't being fair to the play. Yes, the use of technology is really cool when it creates that good old magic! I feel everyone would want to be able to recreate the disappeared world of their childhood, at least I do! I think you should get treatmetn for your legs, because mine were not restless at all during teh show, and it was awesome as are msot of his shows. PUre magic as usual.